One thing about Birmingham, it doesn't take long walking out of the city centre to reach suburbia. Aston is one such area, just beyond the inner ring road, a mix of terraces and flats and towers with a population whose ethnic make-up reminded me of home in East London. 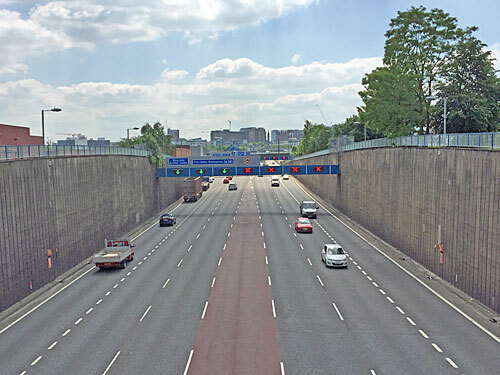 Carving through is the Aston Expressway, a 1960s motorway linking the M6 to the centre of the city, less a dual carriageway and more a 7-lane canyon whose central lane switches direction according to peak flow, hence not for the faint-hearted driver. 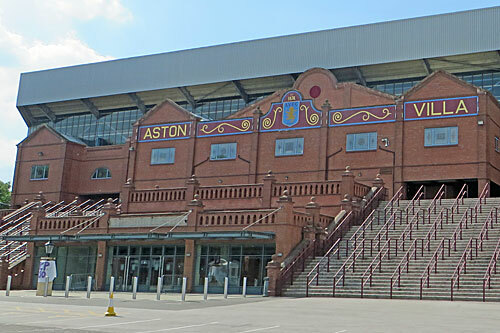 The other big local presence is Villa Park, home to Aston Villa football ground, a drab fortress whose exterior is enlivened only by a bit of nice lettering on the brickwork at one end. Occasional glimpses can been seen of banks of seating in claret and sky blue, within a capacious interior that's hosted more FA Cup semi-finals than any other ground. But the tale I'd like to tell is that of the mansion across the road in Aston Park, in whose kitchen garden Aston Villa's Villa Park was built. 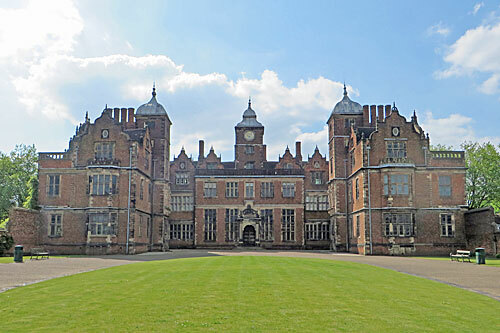 That's Aston Hall, a magnificent Jacobean mansion built to impress, with two ornate symmetrical wings and chimneystacks aplenty. Construction began almost exactly 400 years ago, to meet the dreams of local landowner Sir Thomas Holte, and took almost two decades to complete. His timing was unfortunate because the English Civil War broke out shortly afterwards, the surrounding populace being strongly Parliamentarian, and the house came under attack on Christmas Day 1643. One cannonball made it through the walls and through a balustrade on the Oak Stairs, leaving a hole which has never been repaired, and which tour guides take great pleasure in pointing out. I've never yet been on a bad tour organised by Birmingham Museums, the umbrella body now responsible for maintaining the city's municipal heritage stock. In this case our small group was lead by a fervent Villa fan, mixing facts with colour on our three storey safari from the ostentatious entrance hall to the servants quarters. 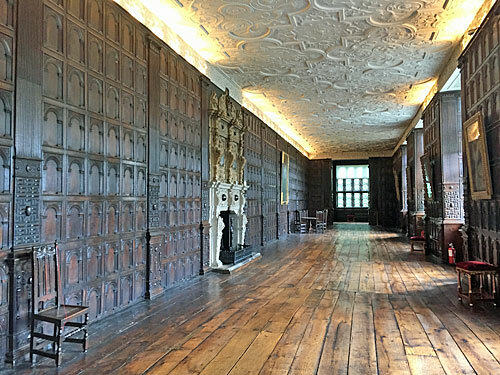 The wood panelling is gorgeous, if a bit warped in places, such as the undulating floor of the Long Gallery (one of the longest in England). 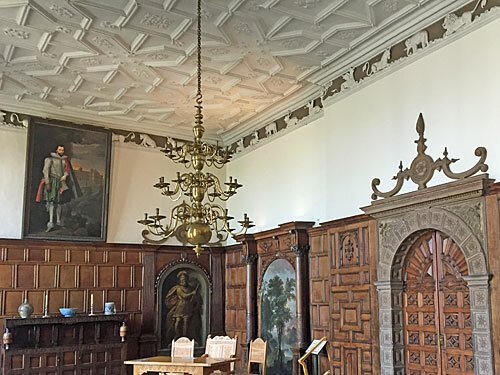 More impressive is the ornate plasterwork across and around several ceilings, incorporating pagan figures and the occasional anachronistic elephant (added by a later owner, the son of engineer James Watt). 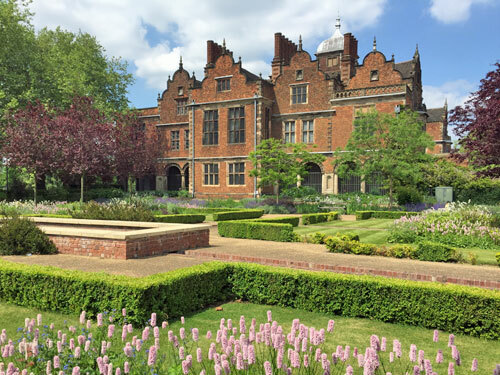 The house boasts a room where King Charles I actually slept, five days before the Battle of Edgehill, and an attic garret where Sir Thomas is said to have detained his daughter for trying to elope with a lowly farmer's son. She stayed locked away for years until she went mad and died, whereas Sir Thomas lived to the age of 83, an almost unheard-of longevity for the time. The tour runs weekdays only (you get to go round on your own at weekends) and is excellent value at just over an hour, and can be topped off with a visit to the stables cafe, a walk in the beautifully maintained formal gardens, or a sprawl in the surrounding park. Next time you're in Birmingham, that is.